At the end of the article, I’ll offer a free downloadable checklist so you can quickly examine and improve your individual setup. First, let’s look at the four basic functions of a chicken coop. Offers enough shelter for all the chickens to find protection from rain and snow. Should be closed off on the windy and cold side. Provides shade from the sun. Supplemental heat or insulation isn’t necessary for US Hardiness Zones three and above (if you have a winter hardy breed). Remember, heat brings moisture and moisture hosts disease and mold. Housing openings should face the sunny side. You can opt for 25% of the roof to be open as long as the sheltered area is large enough for all the birds to find refuge from the rain/snow if needed. Open up the front of your housing as much as possible to capture all the light and fresh air. Many great housing set-ups are 100% open in the front. Install ventilation above where the chickens roost at night. Protect your chickens from driving wind and rain. You can’t have too much ventilation. No more than one-inch gaps anywhere. Housing door should be closed at night to prevent predators unless you have a reliable predator-proof fencing system. Chicken wire or wire mesh should be used over open areas. Now that we’ve covered the functions for the housing, I’ll lay out some basic design principles that should be considered. One square foot per chicken if they have at least three square feet of outdoor space. Build large enough to handle future growth. Three square foot per chicken minimum if their house is permanent and they won’t have access to the outdoors (not recommended). Housing should have a door at least nine inches wide and nine inches tall. If housing is permanent, it’s best to use at least eight inches of deep bedding (carbon material like leaves, wood chips, wood shavings, straw, etc.). If the coop is small, set it up to allow access to eggs from the outside and make it easy to harvest the deep bedding. If possible, allow the manure to fall through the floor to the ground. Move the housing often or harvest the droppings from underneath. Consider placing the housing in the shade when possible, if you’re in a warm climate. Keep your food in metal bins out of reach of mice. In addition to basic function and design, you’ll need to provide certain features like perches, nest boxes, and dust boxes. Here, I explain each of these additions in more detail. 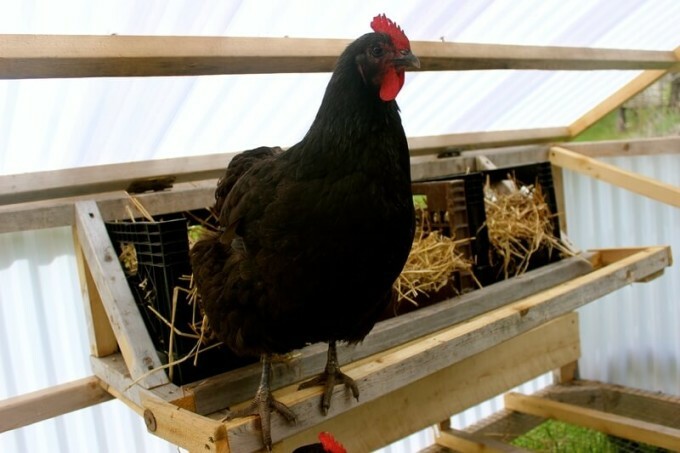 Perches need to be provided as a place for your chickens to roost at night. Roosting is the act of resting/sleeping off of the ground. In nature, chickens roost on a tree limb. In our case, a similar structure will be more like a 2” by 2” board. Chickens roost to maintain warmth (by roosting near each other) and to get off of their manure. 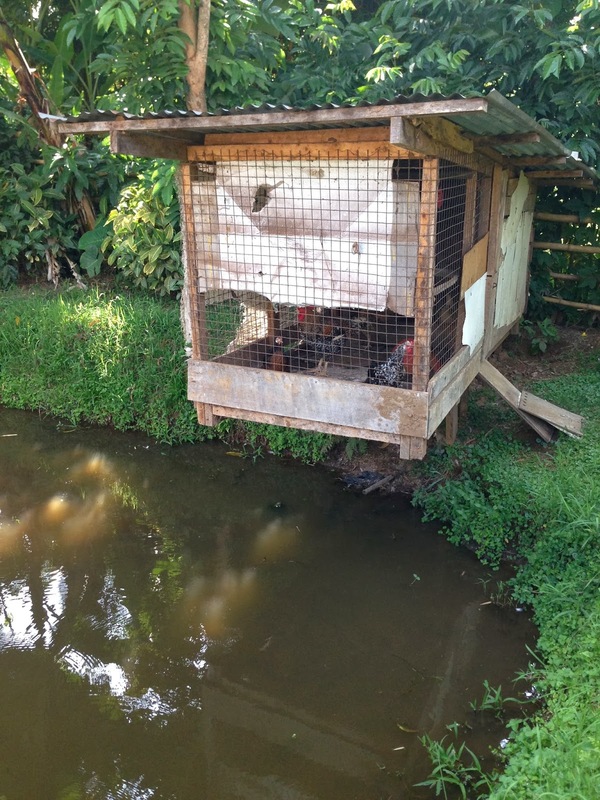 Perches are not necessary for survival as the chickens will settle on the ground if no perches are provided. However, I believe the more you allow the chicken to “be a chicken”, the happier (and more productive) she will be. If perches are higher than three feet, ladders should be provided to reach the perches. Don’t use metal perches because the metal gets cold during the winter, or plastic because it’s too slippery. One chicken takes up about nine inches of perch space; so if you have ten hens, then estimate at least 90” of perches. Nest boxes should be roughly one cubic foot each, and you’ll need one nest box for every ten hens. Hens naturally seek out a small dark area to hide their eggs, so we must keep that in mind as we build. 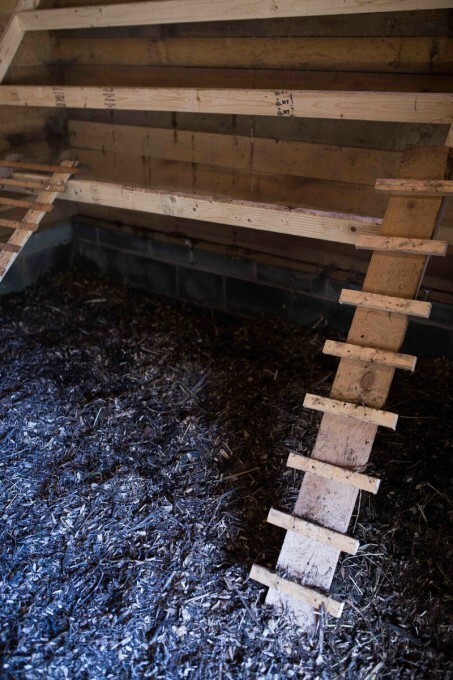 Make sure the nest boxes have roofs (preferably angled) so the chickens don’t perch on top and leave their manure. Have at least a four inch wall in the front opening to keep them from scratching out their nest bedding. For nest bedding, use shredded paper, wood shaving, or straw (my favorite). 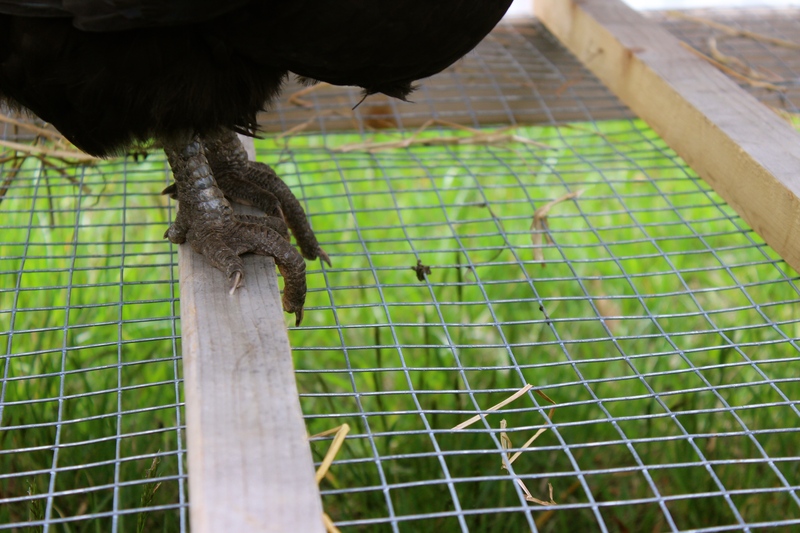 Make sure you provide a landing bar about four inches out from the nest box so that your chickens don’t jump straight into the nest box. It is a good idea to have this landing bar swivel up to serve as a nest blocker as well. Sometimes you might need to implement the nest blocker if chickens are sleeping/pooping in the nest box. If needed, you could put up the nest blocker in the early afternoon after the chickens have laid all their eggs. 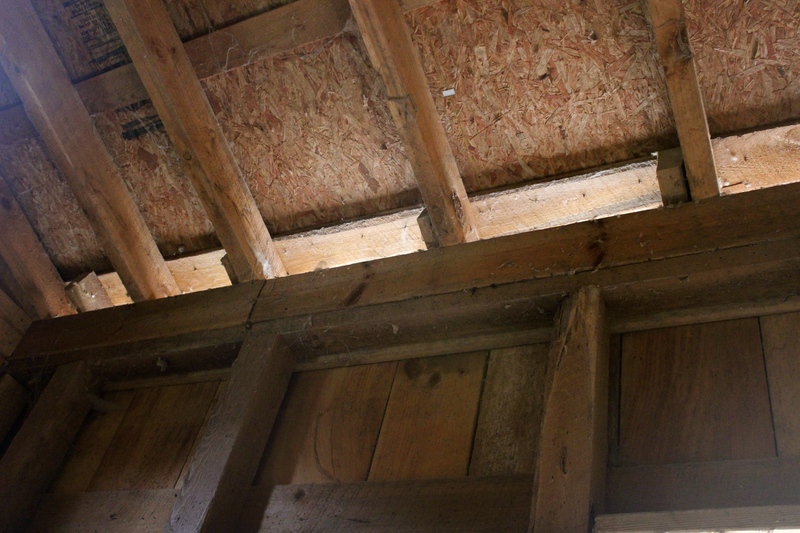 Place the nests above the chickens eye level on the floor. If they loiter around the nests and see the eggs, they will be tempted to peck them. Consider mesh bottoms for the nests to allow for self-cleaning (smaller debris will fall through). I’m currently customizing milk crates to serve as nests, and I won’t add a bottom so that the smaller material can fall through. Dust Boxes are boxes filled with dust so that chickens can take dust baths, which help keep mites at bay. It’s a good idea to provide a dust box of about two square feet and 18” tall inside the chicken house because you don’t want it to get wet. Your chickens will still want to take their dust bath even if it’s rainy or snowy outside. I use an old plastic storage container and I put the lid on at night, so the birds don’t roost on it and poop in it. If desired, provide an outdoor shelter over some bare earth for a continual outdoor dust bath. I’ve seen people using large plastic culvert cut in half for this purpose. I prefer a 14 gallon Rubbermaid tote like this one. Or, could assemble a box out of plywood that is about 2′ x 2’ x 18″. You can add wood ashes – one part ashes to four parts soil. Add a handful of garden lime or food grade diatomaceous earth if needed. 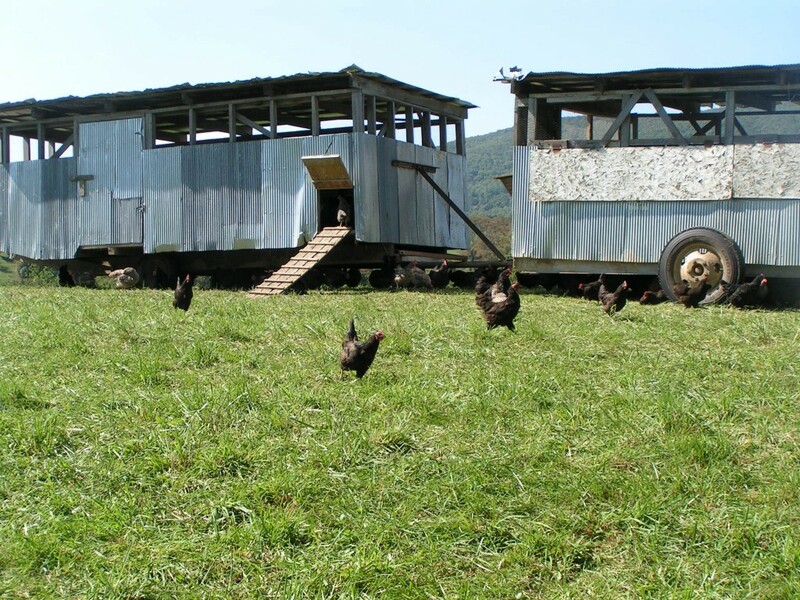 A chicken tractor is a small, movable chicken house without a floor. It’s called a tractor because of its ability to put the chickens to work. The tractor can be sized according to its duty. Sometimes they are sized to house a certain amount of chickens, while other times they are sized to fit over a certain garden bed. I make my chicken tractors 40” x 10’ as that is the size of my garden beds where I’ll be using my tractors. Capacity should be at least one and a half square feet per chicken if used for meat birds and three square feet if used for egg layers. Inexpensive to build or acquire. A great way to fertilize a yard or garden bed. Till your garden beds to prepare for planting or clean up spent produce. Great for small yards and gardens. Can be moved daily to offer fresh forage. May be used as a day shelter for day jobs or as permanent housing. Small. If you have the Dinos (this is what I like to call chickens) in there full time, I would only recommend 3 or 4 birds. If it’s just there hotel, you can easily fit in 12. I use my chicken tractor all summer as a hotel for my breeding flock. I set the small flock (about 8) in my kitchen garden area. Then, I bring in the corners and sides of the electric poultry net when I want to plant my gardens. These pens are designed to be moved at least once a day, giving the chickens fresh grass. Because of this frequent moving, you can give them less square footage than a static coop. 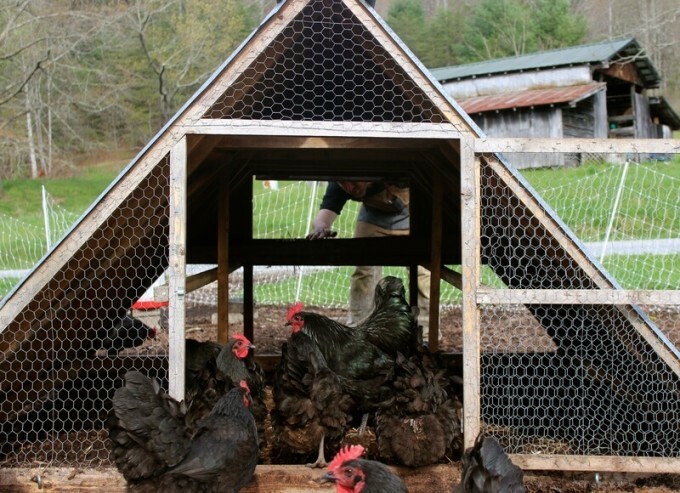 Joel Salatin puts 75 Cornish Cross broilers in his 10’ x 12’ x 2’ pens for the last five weeks of their life. That’s a little more than one and a half feet per chicken. At first that might sound extremely tight, but if you move them every day for eight weeks that is 120 new square feet a day for 56 days (6,720 square feet or almost 90 square feet per chicken). That’s significantly more than the industry standard of about one square feet for the bird’s entire life. Easy and affordable way to get started with a large number of chickens. Usually heavy enough to withstand winds and predators. Can be moved by just one person. Scale up by simply creating more. It can serve many different purposes such as raising broilers (meat chickens), pullets (young laying chickens before they’re old enough to lay eggs), mama hens with chicks, or permanent housing for a small flock. Larger numbers of chickens per pen can nearly decimate the ground in one day. Can be heavy to move without a special welded dolly. I’ve had to move mine by dragging. I even lined the bottom with PVC, but it is still quite a pull to move it. You can run over chicks (kill or injure them) if you’re not very careful. The pastured pen has been a well-rounded set up on my farm. I’ve used this for broilers, housing layer birds, isolated chickens, and chicks. My personal favorite use for this pen is for allowing a mama hen (or three) to raise their chicks. Hawks are a major problem on our farm and will easily prey on the young chickens (even with the watchful mama hen). The name says it all for this type of design. 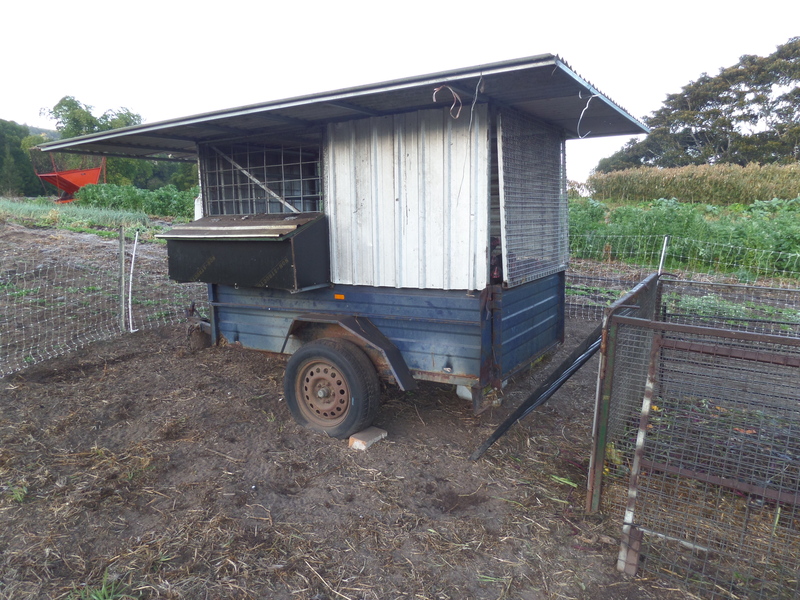 Mobile coops can vary in size. 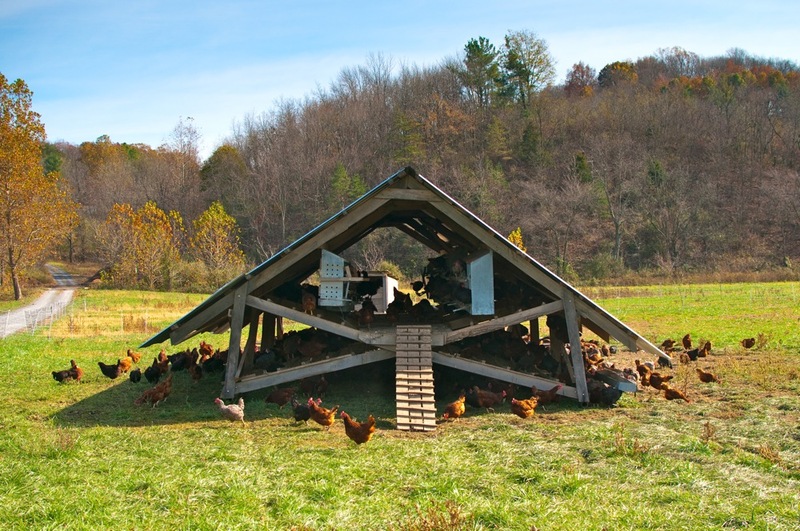 I’ve used Harvey Ussery’s A-frame design for years (it houses about 30 chickens). 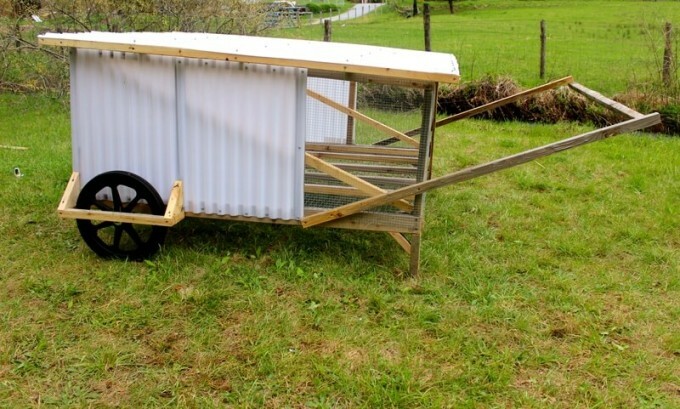 Some folks, like Geoff Lawton, convert small trailer frames into coops while Joel Salatin is famous for his large egg-mobiles. I’ve designed and built on a relatively new concept, the Chickshaw, ChickShaw 2.0 and ChickShaw MiniMe. 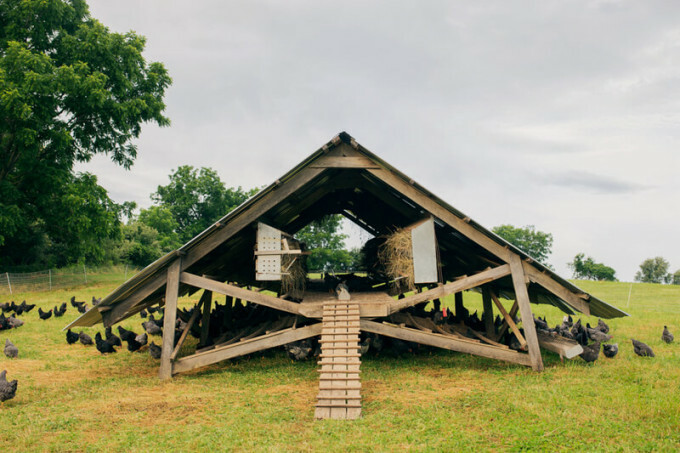 What sets the Chickshaw apart from other designs is that it can hold up to three dozen chickens and still be light enough for one man (or woman) to move the coop long distances through relatively treacherous territory. 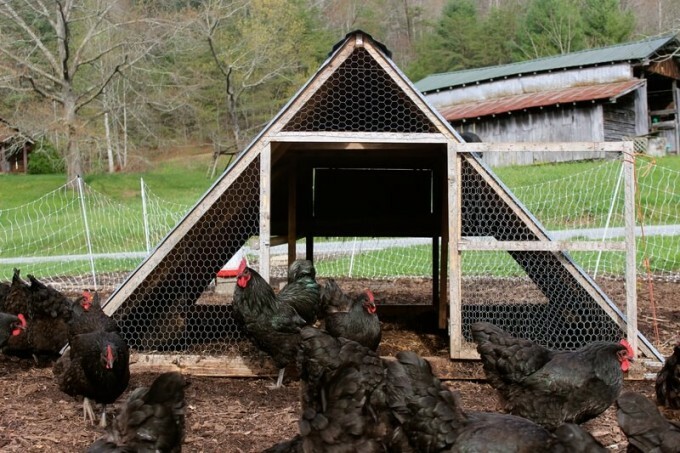 Typically chickens will have plenty of access to the outdoors during the day with this kind of operation, so one square foot per chicken should suffice. 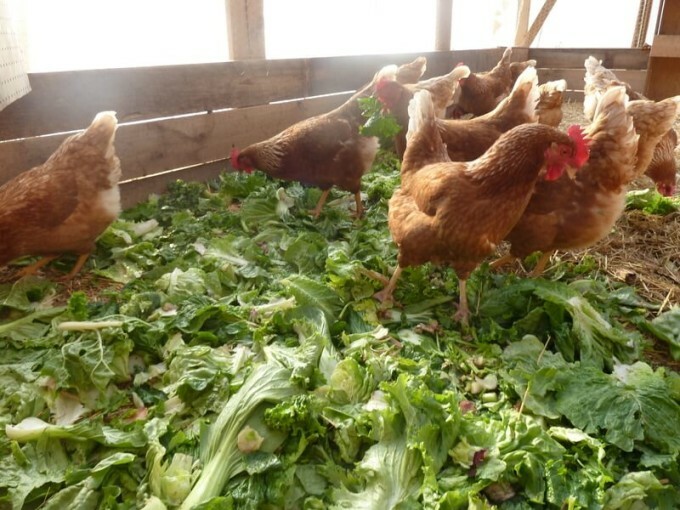 Having a mobile chicken coop enables you to offer your chickens a new “salad bar” whenever the coop is moved while maintaining familiarity for the chickens. Offers chickens fresh food when the coop is moved. The coop is “home” so the chickens naturally center their lives around it, no matter where it ends up. Moving to new ground can create a significant amount of food for the chickens in the coop. No poop cleanup as it falls on the ground. If you’re completely free-ranging (no electric net fencing), then you’ll need a significant amount of acreage (about 40 acres). Otherwise, your chickens will become familiar with certain areas (like the shade by the creek), and they’ll loiter there. Large coops must be moved with a vehicle or tractor. I’m operating at a smaller homestead level, which means I have between two to three dozen chickens at any given time. I also require that my mobile chicken houses can be moved by “man power”. I’ve used Ussery’s A-frame design for years and find it quite useful when I don’t need to move the coop long distances, or over rough terrain. The A-frame is great for year around “permanent” housing. 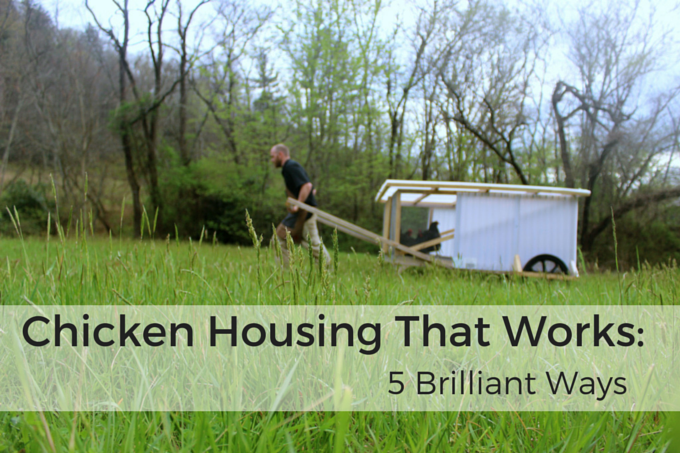 Also, because it doesn’t have a floor, it can be used as a chicken tractor. However, it’s so heavy and has such a low center of gravity that it’s not great for moving around in the pasture. I’ve created my Chickshaw, which is lighter than the A-frame, and the floor serves as the perches and allows night manure to drop through. The large, pneumatic wheels (26”) allow easier movement over further and more tortuous distances. 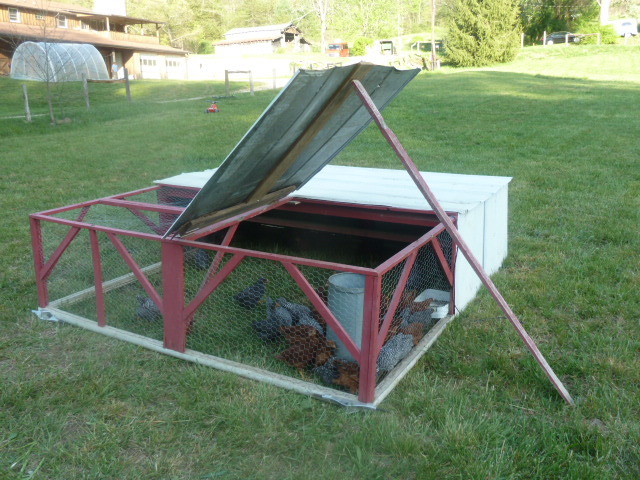 The tall wheels also allow for the chickens to seek shelter under the “shaw” during the day. The Chickshaw can hold up to 36 chickens and can still be moved by one person. In addition, the manure falls through the housing floor directly to the pasture floor or a bed of carbon. UPDATE: I’ve since created a new ChickShaw design and made over 20 improvements. Check out the ChickShaw 2.0 and the ChickShaw MiniMe (for 16 birds or less). A greenhouse is a winter season option for cold climates. You can easily convert a greenhouse into a chicken coop by boarding up the sides (at least two feet) to hold in deep bedding and by adding a four foot fence to protect the plastic. Add about one foot of carbon material (wood chips or leaves work great for this) to absorb the manure. This amount of carbon should be good for about 100 days at three square foot per chicken. Feed by dribbling the food directly onto your carbon material. 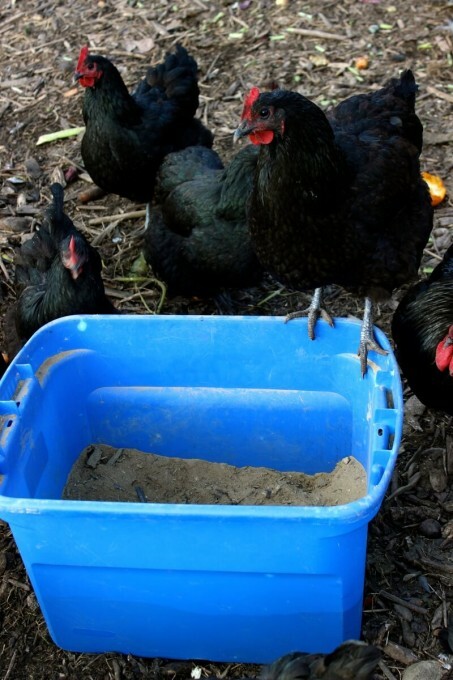 This encourages your chickens to scratch and stir the material, keeping the manure well circulated. Some of the lost seeds will warm up and sprout (adding value when finally found). Joel Salatin adds young pigs and rabbits to the greenhouse mix. 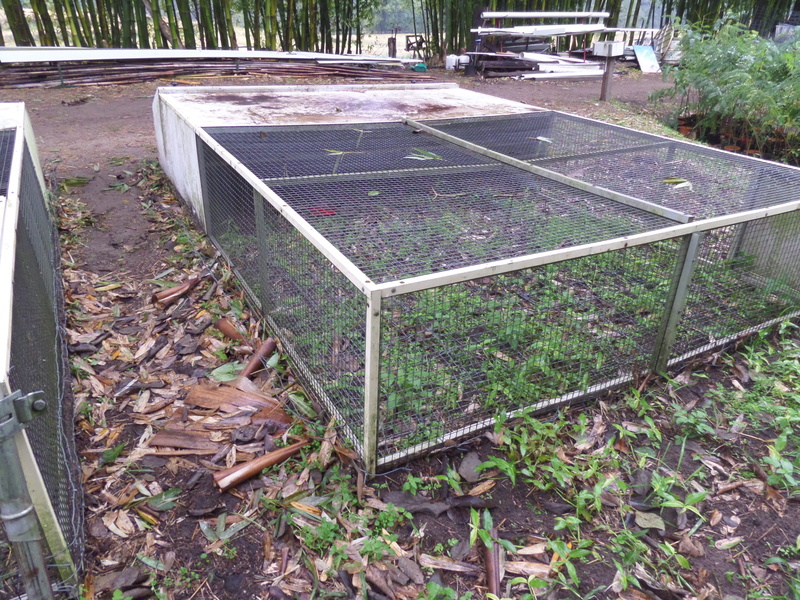 He hangs the rabbit cages off to the side where their manure drops down to the carbon. Then, he creates a level in the middle that only the chickens can get to (so the pigs don’t get the chicken food), and he feeds the pigs directly. The pigs do a great job tilling the hard wet spots that the chickens can’t work in. To keep the chickens and pigs off of the plastic, use hog panels and electric netting. As a bonus, grow veggies in the bedding when the animals go out! Three square feet per chicken. Keeps chickens warmer during the cold months. Creates a good growing medium for spring greenhouse crops. If your greenhouse is next to your garden, you can give the chickens an outdoor run on deep bedding over your garden. Takes up greenhouse space that could have been used for plants. If you don’t plant in the greenhouse in the spring, you’ll need to muck out the compost material. It may be hard for you to acquire that much carbon material. If you don’t use pigs, you’ll have to physically loosen some of the wet and harder spots for the chickens. Several years ago I opted to house my small flock of 15 or so chickens in my little greenhouse (about 10’ x 15’). I lined the sides with a two foot wooden wall to hold in about a foot of wood shavings for deep bedding. I grabbed an old book-shelf and added some boards to the front of the shelves to hold in nesting material. I mounted a four foot fence made out of chicken wire to keep the chickens from jumping over the wooden wall or pecking the greenhouse plastic. The result? My chickens loved it! On top of that, they were more productive in their egg laying than in previous winters. I can distinctly remember how bright, lively and warm it felt in the house all winter. At the time I was picking up organic produce “waste” from the local co-op grocery store, so I’d throw those food scraps directly on top of the deep bedding to get consumed or mixed into the composting material. The greenhouse was unheated, so it still got cold at night; however, the chickens had each other for warmth, and the greenhouse protected them from wind and rain. There were many single-digit nights and everyone did just fine. Looking back, I would have added more ventilation on the top sides of the greenhouse and an outdoor run topped with lots of carbon material that could serve as an outdoor garden once the chickens were removed. The majority of chicken keepers seem to use the static coop and run method, but it’s probably the most unproductive housing system I’ve mentioned. In a coop and run situation, neither the coop nor the run are mobile. In many of these situations, the housing has a floor and the owner has to muck out the manure regularly. If the run is left bare (which seems to be the case most of the time), then all vegetation is soon depleted, the soil becomes contaminated (too much manure) and precious run-off of valuable manure and topsoil can occur. In addition, a bare chicken yard can be quite unattractive, smelly, and tricky to walk through. 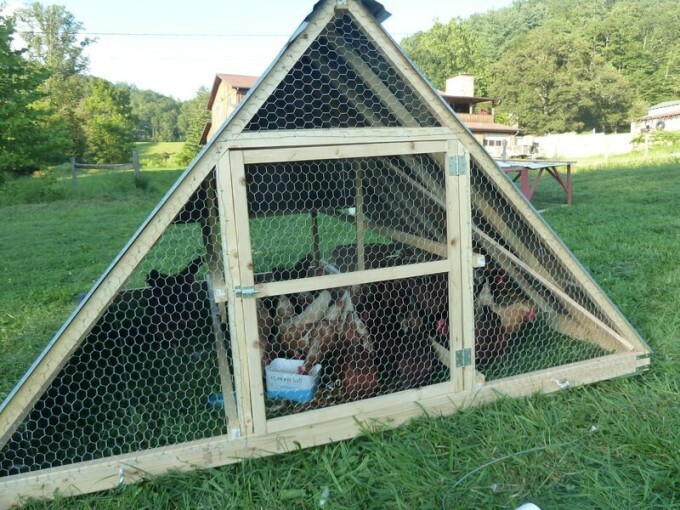 If moving your chickens’ housing isn’t an option, you might consider rotating a mobile chicken fence around the housing. For example, you could have four doors near each corner and rotate your chicken through four temporary yards, giving each paddock time to rest. You might also consider two fences next to the housing in which one is for a garden and the other is for the chickens. In this case, let one area be your garden for one year and let the second area be for your chickens, and then switch it the next year. If you can’t have more than one house and one run, you can still get some significant work done by simply adding organic matter! Add high carbon material like leaves, wood chips, straw, etc. (at least eight inches). 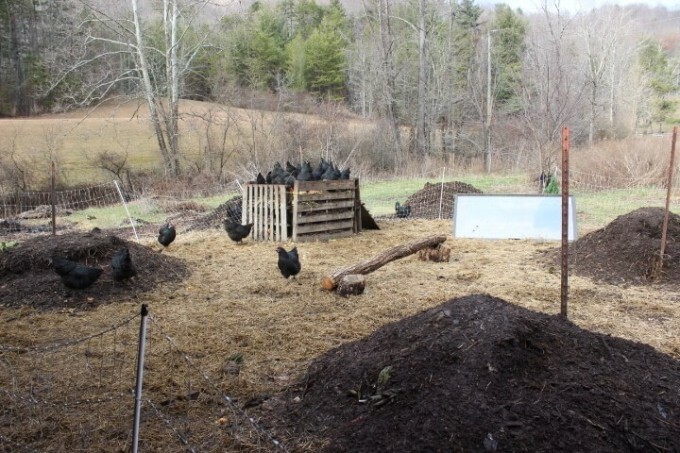 As the chickens scratch and fertilize, the bottom layers will start turning into compost. After several months, you can begin harvesting the compost from the bottom of the run, and just add more material as you go. Due to some health issues, I kept my chickens in a static coop and run last year. I live in a horse ranch barn, so I converted one of the downstairs horse stalls into a coop for my chickens. I used an electric net for their “permanent” fencing. During this time I implemented a compost system that provided 100% of all my flock’s food needs and gave me one cubic yard of compost a week! Refer to my article, “How I Cut My Chicken Feed Costs by 100%” here. I’ve summed up most of the general chicken housing categories. 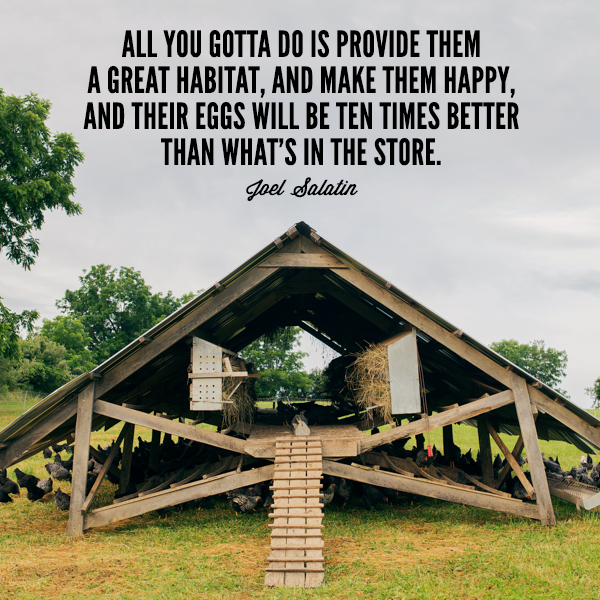 Other ideas like putting chicken housing over ponds (to fertilize) or Joel Salatin’s Millennium Feathernet are amazing concepts and might be applicable in your situation. Download my free housing checklist to quickly examine and improve your own set-up.